You know what I love about chili. The versatility. The simplicity. The “fill-icity.” (How filling it is…and how it satisfies the bottomless pit bellies that sit around my dinner table every night.) The cost effect-icity. See why I love it so much. So many needs met in just one bowl! Hurst Bean Handmade Clay Pot Giveaways are still live…enter quick! They end today! Tyler really, really, really wanted to pick a bean out of the chili for a little pre-dinner snack! Soak the beans in large bowl with water overnight. Or in a bowl with hot water for at least 2 hours. 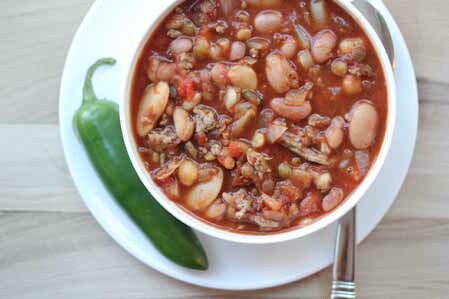 In a large pot or Dutch oven, add the chopped onion, chopped jalapeno and ground beef. Brown the beef and drain if necessary. Return to the pan and add the cooked beans plus reserved liquid, the crushed tomatoes and the spices. Let simmer for 10 to 15 minutes. 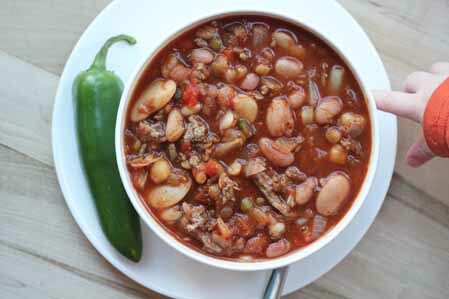 Serve Spicy 15 Bean Chili with side of favorite veggies. Cost $5.66 for 8 servings! Wahoo! *Disclosure: This recipe is part of the Hurst beans campaign. I am receiving compensation as part of the campaign. Hope you enjoy the recipes and the giveaways! This recipe is featured on SouthernPlate.com’s Meal Plan Monday #40. It was good, I use tomato juice instead of water.